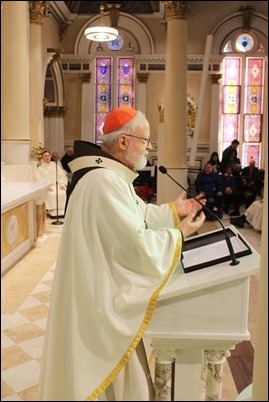 Live press conference with Cardinal Sean O’Malley regarding the death of Cardinal Bernard Law. 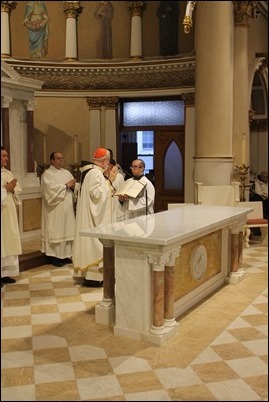 As regular readers will remember, last week I was in Rome for meetings with the Holy Father, and I shared with you some of those experiences. 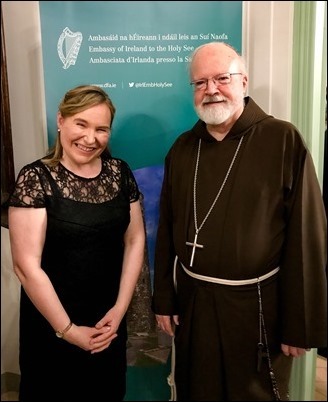 One event that took place after my blog post last week was a Christmas reception at the Irish Embassy to the Holy See, hosted by Ambassador Emma Madigan. The ambassador was a very gracious host, and she read a beautiful Irish Christmas poem and her little boy distributed chocolate gold coins to all the guests. It was a lovely reception. 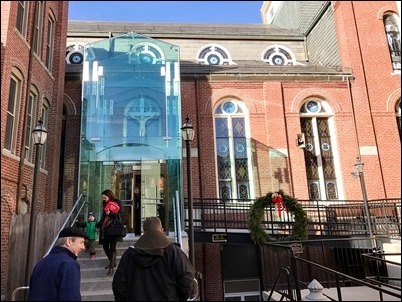 By Sunday, I was back in Boston and was able to be present at the rededication of St. Leonard’s Church in the North End, which has undergone extensive renovations. 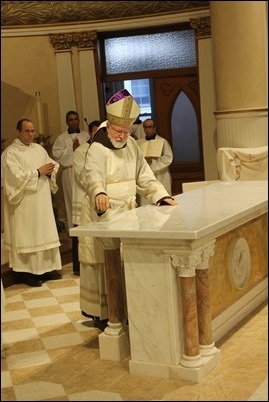 Father Antonio Nardoianni, with the help of the St. Joseph Society and many other generous parishioners and friends of the parish, raised the money to perform these extraordinary renovations, which include a sort of glass vestibule at the back of the church, a new altar, a new arrangement for the pews and many other improvements, large and small. It really is just stunning. 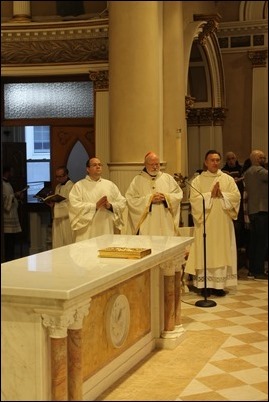 So, I was so happy to preside at the rededication and the blessing of the altar. 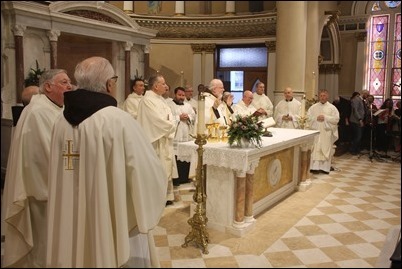 The Franciscan provincial, Father Robert Campagna, was there, as well as a number of friars who had served at St. Leonard’s in the past. 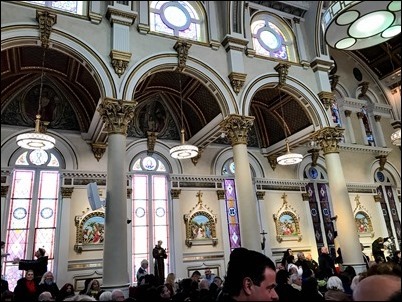 It was a beautiful celebration, and I was particularly moved by the remarks delivered by the head of the St. Joseph Society, Mark Ravensi, at the end of Mass before presenting their check for $1 million towards the cost of the renovations. 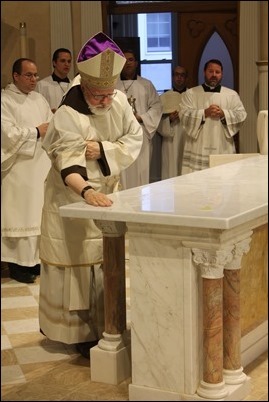 He spoke about the Franciscan Friars who ministered to the Italian immigrants over 100 years ago who were coming mainly from southern Italy and Sicily, at a time when there was so much poverty in that part of the world. 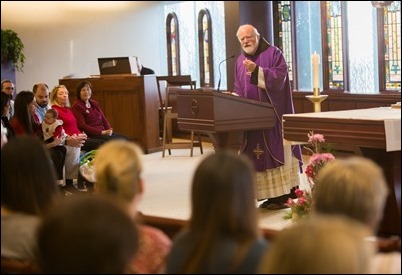 As people fled their homeland, the Franciscan friars at St. Leonard’s helped to make a spiritual home for them and built the parish school and high school to educate their children. 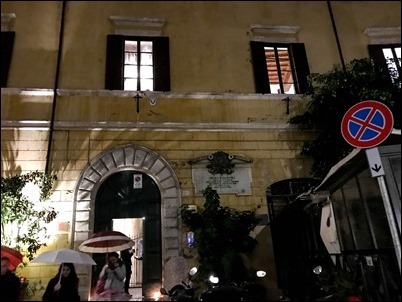 Then, after the terrible influenza outbreak of 1917, which caused so many deaths, the friars were instrumental in setting up the Italian Home for Children to care for the orphans. 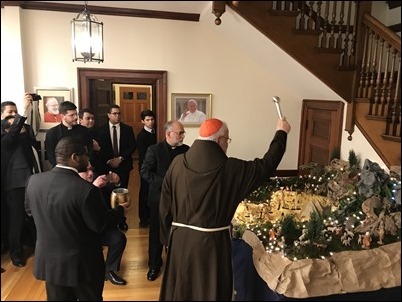 They expressed their great love and gratitude to the Italian Franciscan Friars who had served the people in the North End in so many ways for over hundred years. 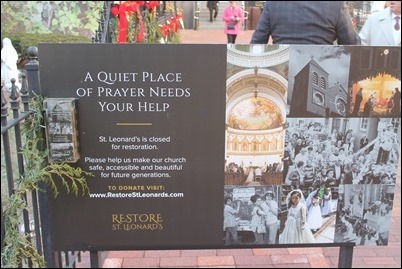 They said that was the reason that they wanted to make this extraordinary donation to help in the renovations of St. Leonard’s. It was a very moving presentation. 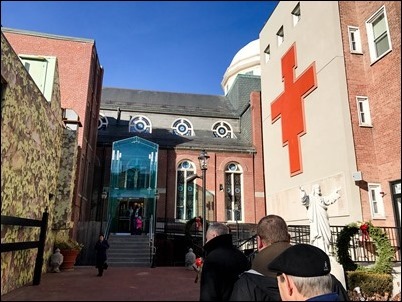 Everyone, of course, is so grateful to Father Antonio who gives such outstanding leadership in the community and is beloved by all of his parishioners. 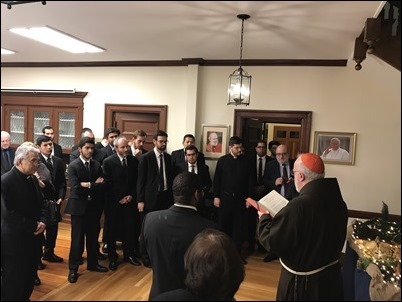 That evening, I attended a meeting of the Board of Directors of our Redemptoris Mater Archdiocesan Missionary Seminary, held at the seminary in Brookline. It was a very productive meeting with the board, and afterwards we shared a meal with the seminary community. The seminarians sang some very beautiful choral pieces for us. 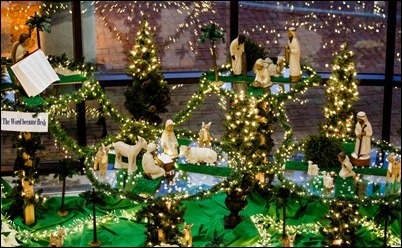 Every year, they put such a beautiful crèche at the seminary. I was very happy to bless it. Monday afternoon I had another seminary board meeting, this time at St. John’s Seminary in Brighton. 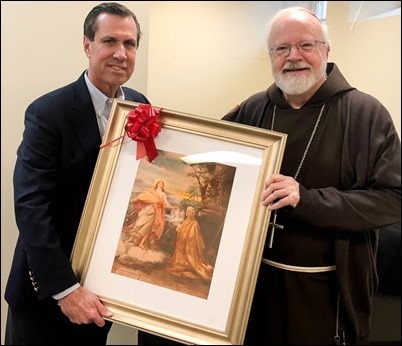 At the meeting, we presented Craig Gibson with a replica of the painting that hangs in the seminary of Archbishop Williams, who is the founder of the seminary, as a thank you gift for Craig as he concludes his time serving on the board. There was another member concluding his service, Brian Hook, though he was unable to be with us at the meeting. 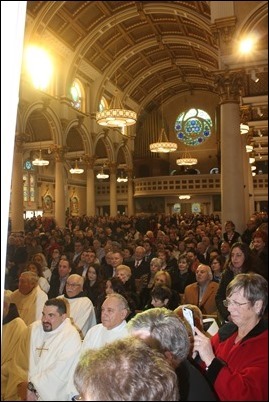 Tuesday afternoon I took part in Las Posadas with the Hispanic community at the cathedral. 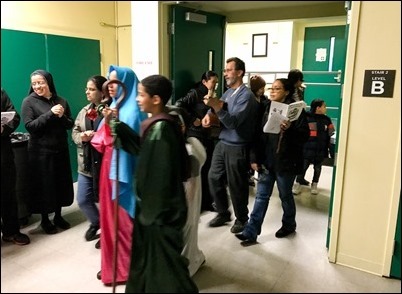 The tradition of Las Posadas is very popular in the Latin American community, particularly among Mexicans. 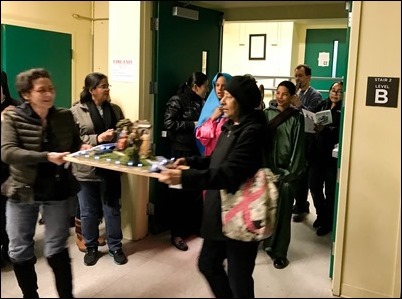 It’s something akin to our caroling, and is a reenactment of Mary and Joseph, who are called “los peregrinos,” (“the pilgrims”) as they seek lodging in Bethlehem. 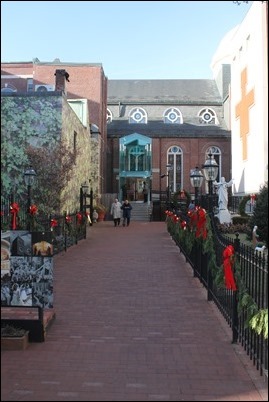 The participants go from house to house carrying statues of Mary and Joseph. They knock at the door of a house and sing carols, which are a dialogue between people inside the house and those outside. In the dialogue, Mary and Joseph ask for lodging, but are turned away. Then, Joseph and Mary insist that they need a place for Jesus to be born, and so the people in the house welcome them, receive them into their house, serve them food and then they all sing Christmas carols together. As I always say, it is history being changed, because as we know the real history is that there was no room for Jesus in the inn. But, at Christmastime, we want to change that and open our doors to Jesus — particularly to Jesus in the person of suffering humanity — and welcome him into our hearts and lives. It’s a beautiful custom that certainly underscores a very important theme of Christmas. 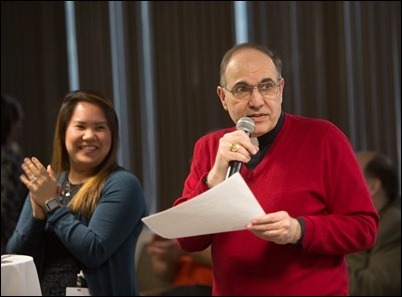 Wednesday, we held our annual Advent gathering for employees at the Pastoral Center. It is always a chance, at this special time of year, to gather together with all our employees and express our gratitude for their service. 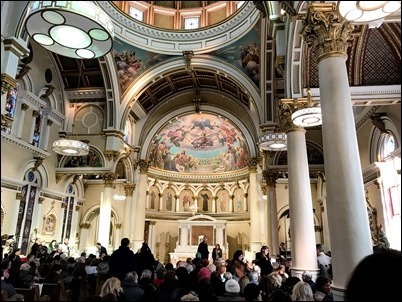 Just as we gathered with our Pastoral Center family this week, I know many of you will be gathering with those closest to you to celebrate this holy time of year. 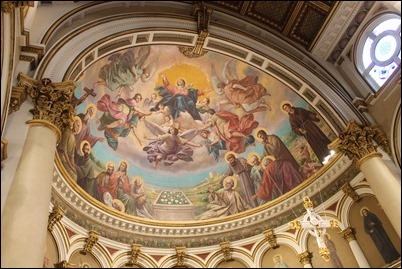 Be assured of my prayers that you and your loved ones have a Blessed Christmas and experience our Lord’s gift of peace!